Donnie Iris returns to Greensburg for the first time after three sold-out shows in 2018 at The Palace Theatre in celebration of his 75th birthday! In or around 1978, Donnie was asked to join Wild Cherry (“Play That Funky Music, White Boy”) in the group’s waning days where Donnie met Mark Avsec, his future collaborator and partner, and the two of them began discussing plans for a recording project. Oddly enough, Mark’s first love (at the age of 15) was a huge fan of “The Rapper” and Mark thought that was somehow profound. Then again, Mark sees profundity in a good many things. Mark and Donnie began writing some songs in Donnie’s basement. Eventually, they wanted to lay down some tracks at Jeree’s Recording Studio. Donnie knew of a terrific bass player named Albritton McClain; he also heard about Marty Lee Hoenes, a hot young guitar player who was playing in a band called The Pulse. Donnie went to go see both Albritton and Marty and, after hearing them, invited both to come down to Jeree’s Recording Studio to record some tracks for an unknown project; Mark invited drummer Kevin Valentine to the same session (Kevin and Mark were then currently in the band Breathless). Mark brought some songs and sketches of songs, a couple of keyboards, and was eager to produce his first record. Pleasantries all around, within a couple of hours the boys were cutting the tracks for “Agnes,” “Ah! Leah!” and the other recordings that would comprise the “Back On The Streets” album. The project revolved around Donnie’s voice and Mark’s song and production ideas – as well as the ferocious playing of Marty, Al, and Kevin. Mark and Donnie decided the record would be Donnie’s solo album, though they wanted the band to have an identity as well, e.g., Tom Petty and the Heartbreakers. But what to call the band? At the time, Mark lived in Cleveland, Ohio and Donnie lived in Beaver Falls, Pennsylvania (that is still the case). All of the boys were constantly on the Ohio and Pennsylvania turnpikes (particularly Mark) going to and from Jeree’s Recording Studio in New Brighton, Pennsylvania. Donnie suggested that the group could be called The Turnpike Cruisers, based on the 1958 Mercury Turnpike Cruiser. The Turnpike Cruisers was promptly shortened to Cruisers and Donnie Iris and the Cruisers was born. The “King Cool” album was recorded in the “stacked vocals” style that Mark and Donnie pioneered on the first album. It yielded the songs “Love Is Like A Rock” and “That’s The Way Love Ought To Be.” It also yielded the song “My Girl,” which reached at or near #20 on Billboard’s Singles Chart. Beginning in 1980, the band began touring relentlessly, pausing only for bouts of recording. During a three year stretch, the band headlined shows all over the country and toured with dozens of artists, including Journey, Loverboy, Bryan Adams, Foreigner, Bon Jovi, The Romantics, Eddie Money, UFO, Nazareth, Ted Nugent, Joan Jett, Hall & Oates, and the Michael Stanley Band to name a few. Two other MCA albums followed (“The High And The Mighty” and “Fortune 410”) yielding songs like “Tough World” and “Do You Compute?” After Donnie and MCA parted ways, several albums were released on a couple of smaller labels. 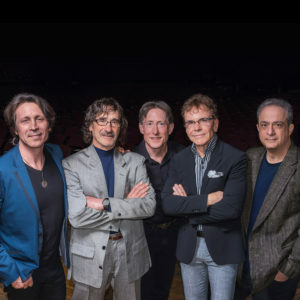 In 1997, after a fairly long hiatus, the original band re-congregated at Jeree’s Recording Studio to record the “Poletown” album, which many consider to be the finest Donnie Iris and the Cruisers album. This album departed in a major way from Mark’s stacked production style, but the playing is typically ferocious (Albritton, Kevin, and Marty are absolutely brilliant), and the songs are lyrically and musically dark and brooding. This album was also the last time that the band recorded with Jerry Reed doing the engineering. Jerry Reed, a lovely and patient man, passed away in 1999. In the late 1990s, with Tommy Rich behind the skins and Paul Goll installed on bass, the band recorded one of the many shows that they then regularly played at Nick’s Fat City, a club in Pittsburgh, Pennsylvania. The live album culled from this show is a snapshot of the band during the late 1990s. In 1999, “Together Alone” was released – a very atypical Donnie record. After some false starts at trying to record a new album, Tommy eventually left the band, for the second time, in 2002. Initial tracks were cut for the “Ellwood City” album with Brice Foster on drums in 2003; additional tracks were cut with Kevin Valentine on drums in December 2004. In August 2004, “Donnie Iris and the Cruisers” celebrated their 25th anniversary before 4,000 screaming fans at the Chevy Amphitheater in Pittsburgh, Pennsylvania. All three drummers – Kevin Valentine, Tommy Rich, and Brice Foster were on the stage (as was Mark’s daughter, Danna, who began sitting in with the band as guest drummer when she turned 16 years old). The “Ellwood City” album, three years in the making, was released in May 2006.